Metastasis of non-small cell lung cancer (NSCLC), indicating hematogenous dissemination, is more frequent in patients harboring epidermal growth factor receptor (EGFR) mutations, who respond dramatically to EGFR–tyrosine kinase inhibitors (TKIs). 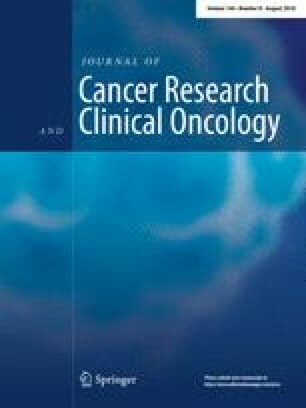 Based on the proposed association of miliary pulmonary metastasis and EGFR mutations in the previous studies, we conducted a retrospective study to assess survival of NSCLC with miliary pulmonary metastases in 223 patients harboring EGFR mutations who were treated with single agent EGFR–TKIs. Progression-free survival (PFS) and overall survival (OS) with single agent EGFR–TKIs were 11.7 months [95% confidence interval (CI) 9.6–13.7] and 23.7 months (95% CI 20.3–26.9), respectively. Patients with and without miliary pulmonary metastases were matched using propensity scores (n = 29 per group) based on clinical characteristics. After matching, the PFS were 8.2 months (95% CI 5.2–15.0) and 14.3 months (95% CI 9.6–30.0) (p = 0.02) in patients with and without miliary pulmonary metastases, respectively. Conversely, the OS were 15.3 months (95% CI 10.6–19.4) and 27.9 months (95% CI 22.0–33.0) (p = 0.003) in patients with and without miliary pulmonary metastases, respectively. By multivariate analysis, miliary pulmonary metastasis was associated with poor prognosis (p = 0.0035). The prognosis of patients with advanced NSCLC harboring EGFR mutations with miliary pulmonary metastasis demonstrated significantly worse outcomes compared to those without miliary pulmonary metastasis. This study was presented at the 17th World Conference on Lung Cancer of the International Association for the Study of Lung Cancer (IASLC) (P-1323). The authors thank Makoto Saito, the Senior Biostatistician at the Office for Clinical Research Support in Tokyo Metropolitan Cancer and Infectious diseases Center Komagome Hospital for statistical advice. The authors would like to thank Enago (http://www.enago.jp) for the English language review. The study protocol was approved by the Ethics Committee of the Tokyo Metropolitan Cancer and Infectious diseases Center Komagome Hospital and was conducted according to the Declaration of Helsinki. The Ethics Committee of the Tokyo Metropolitan Cancer and Infectious diseases Center Komagome Hospital waive the requirement for the investigator to obtain a signed consent form for participants.